Abstract: In his landmark book Native Science (2000), indigenous educator Gregory Cajete eloquently articulates the motivations and questions that drive this study. For Cajete, effective education of our time entails “finding heart.” Finding heart is an active process within and beyond the person. It is evident in ethically and spiritually grounded work and being that embody meaningful connection to and care for others and nature (p. 288). This article relates to the process of finding heart through sustainability education. It presents a grounded-theory-based study of aspects of sustainability education that motivate or detract from activating hope and agency among undergraduate college students. Specific aspects of conceptual and social engagement, as well as the duration of these effects, are examined in some depth, with the voices of students themselves reflecting the diversity, depth, and power of their experience. The author concludes by suggesting that generating hope and agency among students is a vitally important outcome for sustainability education as part of the larger movement for sustainability. She also suggests curriculum design considerations for effectively activating hope and agency among students. The transforming vision … must be deep enough to encompass all that we have become, along with all that we must now become as participants in the healing and regeneration of the earth. That vision must open up our future to hope and recreate us a ‘people of hope.’ The education engendered from such a vision must be all-inclusive. Each person must feel that his or her life and work are significant in making such a global reality come into being. The new kind of education, work, and play must embody hope. Hope is, after all, a choice. We have to teach ourselves and others that we can make a difference. Choosing a life of seeking life is the central message of Indigenous cosmologies, and also reflects the deepest aspects of human nature. Finding heart is a metaphor that captures the impassioned purpose and spirit essential in sustaining the effort needed to transform our lives. What are some of the ways this heartfelt motivation can be fostered? How can heartfelt thought and energy be mobilized to engender knowledge and values, reorient power and intent, move from arrogant humanism to the development of the ecological human, and create a modern cultural base for ecological ethics and a reverential consciousness toward all life? These are the foundational questions (Cajete, 2000, p. 288). The purpose of this study is to reveal approaches to and aspects of sustainability education that serve to generate and maintain hope and agency in students – and also to identify approaches to and aspects of education that may detract from these processes. I propose that, if sustainability educators and activists learn more about the process of fostering sustainability-oriented social change through stimulating students’ drive to learn and do sustainability, we can be more effective in our work that is ultimately aimed at the all-pervasive, pressing, and deeply challenging project of moving toward sustainable lifeways. This research focuses on processes of fostering hope and agency – of finding heart – among upper division college students pursuing a Bachelor of Arts degree in Sustainability Studies at Colorado Mountain College (CMC). The approaches and themes explored here, however, may be relevant beyond the context of a single institution. Educators and activists working across diverse settings and educational levels may be able use my methodology and findings as starting points for their own studies and as a source of perspective on how to stimulate individual and collective agency in sustainability education and within the larger sustainability movement. Before discussing my findings regarding educational processes of generating and maintaining hope and agency, I will elucidate the conceptual underpinnings of my research and explore its relationship to other research, theory, and practice. I will also explain my research methodology and methods. The following section clarifies key concepts that will be discussed throughout this article. When discussing complex ideas and practices related to hope, agency, sustainability, and transdisciplinary praxis, it is important to be clear about what one means when using specific terms. This section explains the conceptual framework for this article and defines key terms used in analyzing and interpreting research data. For me, a robust notion of hope that is relevant to the all-pervasive challenges of sustainability derives heavily from Vaclav Havel (1990), a writer, philosopher, and dissident who became the first democratically elected president of the Czech Republic after playing an important role in the Velvet Revolution that toppled communism in that country. Havel’s notion of hope is beautiful, extremely practical, and highly relevant to the pressing and extremely challenging project of sustainability. Havel conceptualizes hope as an active foundation for one’s very humanity, a way of being that opens doors to possibilities that things might be different. For Havel, hope is not simply a pleasant feeling or delusional optimism, and it is not attached to the probability of desired outcome – in fact, quite the opposite. For Havel, the more unlikely the desired outcome, the more substantial is the hope of those pursuing change (see Havel, 1990, p. 180). Hope in Havel’s terms is action that flows from the ethical core and heart of the person. It both builds and preserves one’s humanity, even in cases where the challenges one faces may be insurmountable. This notion of hope shares the Buddhist orientation toward nonattachment to specific future outcomes that is combined with deep compassion for others and the world. It is also closely related to David Orr’s (2009) notion of “clear-eyed hope” as hope grounded in one’s well-informed understanding of the depth and breadth of the challenges faced. When applying hope to sustainability, we see that the challenges we face span both the human and more-than-human worlds. Activating hope in this context, as depicted by Cajete in the opening epigraph to this article (2000, p. 290), creates a wellspring of transformative vision that can become a tangible path for our collective movement forward and outward through space and time. And takes shape through agency. But where does agency come from? In Occupy Education (Evans, 2012, chap. 2), I develop a theory of sustainability-oriented agency rooted in Antonio Gramsci’s (1971/1999) notions of agency and praxis. For an in-depth development of these concepts, please consult this prior work. To summarize, Gramsci’s notion of agency is deeply historicist. It is neither strictly idealist nor materialist. Gramsci posits that concepts and material experience both emerge within the framework of history. For Gramsci, because ideas emerge in dialectical relationship with history, they can either mirror or critique the status quo. Therefore, both critical consciousness and material experience can serve as launching points for praxis (Gramsci, 1971/1999, p. 371). Praxis, for Gramsci and others (1971/1999, pp. 333-334; Freire, 1970/2000), is the unity of theory, practice, and reflection that generates conscious, purposeful action aimed at resolving the pressing challenges facing society at any given time in history (for Gramsci, the most pressing challenges were the social contradictions of the capitalist system) (Gramsci, 1971/1999, pp. 333‒334). It is also important to understand that there is no escape from agency. We both create the world and are created by it, even if we should choose explicitly not to act consciously or conscientiously. This notion of agency points to the need for sustainability educators to engage students with powerful ideas related to sustainability while also engaging them in sustainability-oriented action. Both conceptually-focused and actively-oriented pedagogical approaches, when combined with each other and with reflection, may ignite sustainability praxis. According to Cajete, “An impassioned explosion of directed action results from critically discussing issues and approaches that affect people in their ‘gut,’ or ‘where they live’” (2000, p. 289). For our purposes here, agency manifests through the unity of one’s worldview and one’s practices. Agency conjoins the ideal and the material within the context of history. In Occupy Education (Evans, 2012, chap. 1), I develop a critical social theory of sustainability as a concept and practice. That theory is based, in part, on James Pittman’s (2007) “living definition of sustainability” as “the long-term equilibrium of health and integrity maintained dynamically within any individual system (organism, organization, ecosystem, community, etc.) through a diversity of relationships with other systems.” Throughout this article, when referring to sustainability as a concept and practice, it is this definition of living sustainability to which I refer. And the process is transdisciplinary. Transdisciplinary studies, research, and action focus attention on thematic threads that inform complex, real-world issues and challenges such as globalization, climate change, and sustainability. Transdisciplinary scholars and practitioners engage with these issues and challenges using integrative approaches to knowledge-making with the aim of transforming the subject(s) of study by informing purposeful human activity. Trandisciplinary research draws upon disciplinary methods of knowledge-making as means to generate and synthesize new knowledge, but transcends the disciplines in its drive to approximate the complex reality of its subjects of study. Transdisciplinary work is integrative, socially relevant, and oriented toward problem solving. Therefore, transdisciplinary work engages with human values in producing knowledge and identifying avenues for action. Throughout this article, “sustainability-oriented education” and “sustainability education” refer to an explicitly transdisciplinary praxis. With our conceptual framework made clear, we will now discuss the motivations behind this study and its relationships to other scholarly work. Sustainability education is an activist field. As a sustainability educator, I am part of a social movement that aims to change the world. Encouraging students to develop sustainability-oriented worldviews and inspiring them to action based on these views is essential to my work. As noted in Occupy Education (Evans, 2012), sustainability education is not indoctrination, but it is counterhegemonic, and it should be based in the most robust, transdisciplinary understandings of the state of human societies and the larger world (chap. 8). Given the purposes of sustainability education, generating and maintaining hope and agency among students are highly relevant and desirable outcomes that make this work truly transdisciplinary and create the very foundation for its effectiveness. Yet few studies exist about the concepts and practices that contribute effectively to generating and maintaining hope and agency among students of sustainability. This study builds upon the small body of existing work on questions of hope and agency in sustainability education (Kerret, Orkibi, & Ronen, 2014; Ojala, 2012) and makes a contribution toward furthering our understanding of these important processes. This research is, in part, a follow up to my study published in chapters eight through ten of my recent book Occupy Education: Living and Learning Sustainability (2012). As I have in the current study, in Occupy Education, I used textual analysis based in grounded theory to identify themes across students’ written responses to open ended questions. In the study undertaken for Occupy Education, I examined 62 final reflective papers from two sections of my course titled The End of Oil. Open-ended essay questions served as the prompts for this final reflective paper assignment (see Appendix A for essay prompts). These questions were related to both hope and agency, but they cast a fairly broad net in terms of calling forth student responses to their participation in the course. The current study focuses more intentionally on processes of generating and maintaining hope and agency among students of sustainability. Student responses analyzed here were anonymous, unlike the essays analyzed for Occupy Education. Therefore, any tendencies for students to try to please me as their professor are reduced here in comparison to my earlier work. The specific research methodology and methods for this current study are discussed below. Agency [also] emerged as among the strongest themes in student essays. Their reflections ranged from direct discussion of the importance of taking action to discussion of specific actions planned or already undertaken in response to taking The End of Oil (Evans, 2011, p. 273). In the concluding sections of this article, these findings will be discussed in further detail in relation to the data analysis undertaken for the current study. Maria Ojala (2012) is one among few researchers who has undertaken rigorous, empirical work related to hope’s role in sustainability-oriented education. She cites a number of studies related to knowledge about and interest in global problems, noting that “although many young people show an interest in global problems, feelings of hopelessness, pessimism, and helplessness, as well as inactivity are common…. Pessimism seems to be particularly strong when it comes to environmental problems … and research has shown that education about global issues sometimes increases these negative feelings. Finding ways to instill hope could therefore be seen as vital” (pp. 625-626). Ojala (2012) notes that “the hope concept is obviously complex; including for instance emotional, cognitive, existential, identity-related and social aspects” (p. 627). She draws upon the work of Snyder (2000) to define aspects of “constructive hope” as one basis for designing her survey administered to junior high, high school, and young adult respondents. Snyder’s notion of constructive hope is highly compatible with my own concepts of hope and agency outlined earlier. Snyder’s framework also provides a useful lens for identifying various aspects of hope and agency in my students’ responses to open-ended questions. According to Snyder (2000), “hope consists of three different components: goals – that which we want to happen; pathway thinking – an ability to come up with routes to get where we want; and agency thinking – the motivation to use these pathways” (as cited in Ojala, 2012, p. 627). In her study, Ojala (2012) seeks to identify and understand roles that hope might play in pro-environmental behavior among young people. Ojala conducted a survey-based study of 723 teenagers and 381 young adults using multiple regression analysis to identify the roles hope plays in human agency related to climate change. Her study controlled for other strong predictors of pro-environment behavior including values, social influences, knowledge, and gender. Ojala’s approach also allowed her to distinguish between hope framed within a clear-eyed understanding of the seriousness and factuality of climate change and hope based in denial of these understandings. She found that “constructive hope” evidenced in “positive re-appraisal, trust in different societal actors, and trust in the efficacy of individual action” (p. 628) had a uniquely “positive influence on pro-environmental behavior” (p. 625) while hope based on denial about sustainability challenges was negatively correlated with pro-environmental behavior. In its concerns, its central questions, and its findings, my work in this article strongly parallels that of Ojala (2012). These points of resonance will be discussed further below in the data interpretation and conclusions sections. My methodology differs from that of Ojala in that I did not utilize an existing framework for defining hope when posing open-ended questions to my students, nor did I ask the students to define it. My methodology also differs from that of Ojala in that it is based in grounded theory rather than survey-based quantitative methodology. Nevertheless, important similarities in findings between our studies help to corroborate results. They call for future empirical testing of their model. In developing this conceptual framework for goal-directed environmental hope, the authors draw upon the work of Ojala (2012) and Snyder, et al, (2002). For Kerret, Ronen, and Orkibi (2014), “environmental hope is posited to contribute to increased levels of EB and SWB” (p. 83). They propose that “students will tend to actually engage in EB if they are cognitively hopeful regarding the feasibility of making a difference in their environment” (p. 84). They also “assert that environmental education will not only cultivate students’ actual EB but also enhance their SWB if it instills students with environmental hope regarding the global ecological future” (p. 84). They also note that initial evidence suggests connections between national happiness and environmental performance indicators, pointing to a “nascent field of positive sustainability” (Kerret, Ronen, & Orkibi, 2014, pp. 86-87). The Bachelor of Arts in Sustainability Studies program at CMC operates according to the principles and processes of a “green school” as described by Kerret, Ronen, and Orkibi (2014, p. 83), but unlike the green schools these authors address, our students are adults and young adults. Still, because it offers a conceptual framework for identifying hope and agency and the relationships between the two, the theoretical model proposed by Kerret, Ronen, and Orkibi (2014) provides a useful analytical lens for interpreting my research data. My current study that is the subject of this article contributes to the nascent theoretical and research literature on hope and agency in sustainability education. As an empirical study based in a grounded theory approach, it offers research-based evidence related to the theories offered by Kerret, Ronen, and Orkibi (2014) while also providing additional evidence related to conclusions drawn by Ojala (2012) in her study of hope’s relationship to agency. In order to elucidate the research context for my study, we now turn our attention to the conceptual and pedagogical aspects of the Sustainability Studies program at CMC. Throughout most of its history, CMC has been a two-year degree and certificate granting community college. Beginning in fall 2011, the college began offering its first two bachelor’s degree programs in Sustainability Studies (SUS) and Business. Since that time, the college has expanded to offer five total four-year degree programs. Through active intellectual and experiential learning, we prepare students to meet the pressing local and global challenges of sustainability. The Bachelor of Arts program in Sustainability Studies at Colorado Mountain College engages students in active learning, critical and creative thinking, and on-the-ground experiences that help prepare them for dynamic careers and lifelong engagement with communities and the natural world. Our courses focus on integrated understanding of the three Es of sustainability (healthy environment, vibrant economy, and social equity) and on applying that understanding to real-world contexts. Our program offers students a unique opportunity to develop personal and professional identities, knowledge, and skills that prepare them for meaningful and productive work in a rapidly changing world. Our students develop a deep understanding of local and global sustainability challenges. They are also encouraged to develop the knowledge, skills, and deep motivation to effectively address these challenges in their personal and professional lives. Diversity of approaches to knowledge making. Our program includes insights drawn from the arts, humanities, social sciences, and sciences. Our courses include the ideas and voices of thinkers, activists, and creative professionals from both Western and non-Western traditions whose work draws upon a wide variety of disciplinary frameworks. Resiliency. Our program prepares students to consider best practices for ensuring the long-term health and happiness of people while also ensuring ecosystem health. Rigor. Our coursework challenges students to learn and synthesize knowledge from diverse areas of study that range from science to philosophy, from literature to economics, and more. Our content is both broad and deep because our graduates must be prepared to take action on complex problems in diverse social and ecological settings. Place-centeredness. Our students learn that sustainability as a concept and practice can only take shape within the context of specific places. What is sustainable in one place may not be so in another, and sustainability practitioners must engage with people in culturally diverse settings. Therefore, we value diverse approaches to sustainability that are responsive to specific cultures and environments. Empathy. We believe education is a matter of both mind and heart. People are motivated to live more sustainably because they care about other people and the planet. We therefore promote the development of a deep sense of empathy in our students – a sense of connection with people and nature that can underpin both motivation for action and a sense of personal fulfillment. Efficacy. Our students have the distinct opportunity to develop critical and creative thinking abilities as well as intellectual and practical capabilities that prepare them to be articulate and effective sustainability thinkers and practitioners. Partnerships. We see sustainability as both an individual and a collective enterprise. Our students learn to integrate sustainability concepts and practices into their own lives. In an effort to also provide our students with valuable experiences working with others, we develop partnerships with businesses, nonprofit organizations, governments, and other people and organizations that are engaged in sustainability work. We seek service learning and internship opportunities that benefit our students, our communities, and the planet. Our students develop critical and creative thinking abilities as well as intellectual and practical capabilities that prepare them to be articulate and effective sustainability thinkers and practitioners. The learning outcomes for each of our courses contribute to these overarching program goals. Articulate and demonstrate effective approaches to knowledge-making. Recognize the importance of research/action ethics, and effectively apply them. Demonstrate extensive interdisciplinary learning through research and other coursework. Articulate a clear understanding of sustainability as a concept and practice, and relate that understanding to one’s life and to the wider world. Effectively present one’s self professionally, demonstrating the breadth and depth of transdisciplinary learning and the ability to apply that learning to a variety of tasks/projects. Demonstrate abilities to work effectively as a member of a team. Recognize and interpret the roles of diverse disciplinary approaches to understanding and realizing sustainability. The SUS program at CMC is clearly designed with the goals of stimulating hope and agency among its students. The questions remain, however, as to which aspects of the program and its pedagogy might do so and which might actually detract from these goals. With these questions in mind, we turn to an overview of the methodology and methods underpinning this study. As noted above, this study about generating and maintaining hope and agency through sustainability education employs a grounded-theory-based approach. I chose grounded theory as my approach explicitly because it is not a hypothesis-driven methodology. Because it refuses to reduce holistic human perceptions and experience to rigid categories or call upon participants to focus their responses according to the categories and assumptions of the researcher, grounded theory is particularly appropriate for studies that explore the essence of complex human experience and understandings. An important part of the vision of grounded theory is to allow research participants to speak with their own voice. This is a goal that I have pursued in this research. Since my current study has not been widely replicated, and since the emergence of important new themes in the data I am gathering appears to be ongoing at this point, I plan to continue this research for a number of years and to invite others to conduct similar research in their own educational settings. The findings from the research presented in this article must, therefore, be considered preliminary. Sustainability educators may find my research useful but should proceed with some caution in applying my findings to their work. For my study, I gathered data through an anonymous online survey through which I posed open-ended questions to SUS students. Students surveyed were in the process of completing the Sustainability Capstone course, a course typically taken in the last term of study in the SUS program. I chose Sustainability Capstone students as participants because of their long-term experience with sustainability education and their likely ability to comment somewhat extensively regarding factors in their educational experience that contributed to or detracted from their senses of hope and agency. I also deemed them well prepared to comment on the duration of the effects of particular content and pedagogies. Student participation in my survey was optional. In spring 2014, 13 students participated in the survey, and 14 participated in spring 2015, yielding a total of 27 respondents. Which, if any, ideas and/or activities in your Sustainability Studies experience significantly contributed to your motivation to continue learning about and taking action toward sustainability? If none of your educational experiences in Sustainable Studies affected you, please explain why. Was the effect of these ideas and/or activities on you (if any) a lasting one? Why or why not? Which, if any, ideas and/or activities in your Sustainability Studies experience significantly detracted from your motivation to continue learning about and taking action toward sustainability? If none of your educational ideas and/or activities in Sustainable Studies detracted from your continued learning and taking action toward sustainability, please explain why. Please offer any additional comments you might have about how your education relates (or might have been made to relate) to your motivation for learning about and taking action toward sustainability. In question design, I sought to avoid making assumptions about typical student responses to their experiences in SUS program. In an effort to avoid confusion about definitions of hope and agency, I also avoided using these terms directly. Instead, I asked about factors in students’ educational experience that contributed to their motivation to learn about sustainability and pursue sustainability-oriented action as well as factors that detracted from these same motivations. The work of Ojala (2012) and Kerret, Ronen, and Orkibi (2014) as well as my own theoretical and conceptual work above and in Occupy Education (2012) allow me to translate discussion of these motivating/demotivating factors into discussion about generating and maintaining hope and agency through sustainability education. After receiving the initial data set in 2014, I created a spreadsheet to track the number of times particular themes emerged in the data and also to track representative quotations related to each theme identified. Interpreting repetition as emphasis, I counted multiple references to the same theme offered by one individual whenever those themes were discussed more than once in reference to different aspects or instances of a student’s experience. I also did not segregate content according to the question category. Regardless of the category of the question to which a subject was responding, whenever mention of a detractor or a motivator related to learning and doing sustainability was mentioned in the data, it was recorded in the data analysis spreadsheet. With regard to comments on the duration of the effects of motivators and detractors to hope and agency, I counted multiple “long-term” or “not long-term” responses for individual respondents who emphasized multiple instances or reasons for the effects of their education being long-term or not long-term. With regard to the themes identified, I did my best to avoid drawing conclusions based on student responses and, instead, to adhere to what was articulated by respondents rather than what may have been implied. Specific themes were identified from each response to each question posed in the survey. When creating thematic categories, I strove to be as specific as possible while also providing enough flexibility so that each response would not generate a unique theme. Once the theme categories were created and the number of instances each was referenced was recorded, I grouped related themes under broader subject headings. During thematic category creation, I also tracked and recorded representative quotations for most themes identified, and I kept a separate sheet in the spreadsheet workbook to track themes unrelated to hope and agency. These themes are few, and most of them are irrelevant to this research. After analyzing the data for thematic content, I read through the data set again, this time focusing on gleaning insights through undertaking a holistic review of each student’s responses to the entire question set. I undertook this step because responses by individual students to separate questions tended, in many cases, to relate to each other. I made notes on a separate sheet in my spreadsheet workbook about any additional insights on hope and agency that I gleaned from this holistic review of the data organized by respondent. This data analysis process was repeated with the spring 2015 data. Additional themes were added as necessary, and a count of the number of times each was mentioned was made for each year’s data set with a total number for both sets also included in the spreadsheet. Additional groupings and slight revisions of thematic groupings were also made possible with the addition of the 2015 data set. Inclusion of the 2015 data allowed me to considerably refine my research findings. One final note on the data gathered: my asking students to consider “ideas and activities” that motivated them or detracted from their motivation to continue learning about sustainability and acting on that learning may have limited respondents’ discussion of emotional and spiritual aspects of their experience. A number of students did discuss their emotional and spiritual responses to the SUS program. Perhaps more would have done so if the survey questions had mentioned these potential aspects of their experience. My research findings and conclusions are the subject of the remaining sections of this article. The faculty who designed the Sustainability Studies program at CMC hoped to kindle in their students something akin to ecological personhood as described here by Cajete (2000, p. 288). Our goals include fostering what Kerret, Ronen, and Orkibi (2014) call “goal-directed environmental hope.” For our program, however, the challenges on which we focus are broader than the environment. These challenges include the economic and equity dimensions of sustainability, and the ultimate goal of sustainability education and activism is conceived of as achieving living sustainability (Pittman, 2007) as defined above. Though our foci include and extend beyond the environment, the goal-directed hope we spark is evidenced in “pathway thinking,” “agency thinking,” and “social trust” as described by Kerret, Ronen, and Orkibi (2014, p. 84; see also Ojala, 2012). As this study demonstrates, hope is also evidenced in additional ways among SUS students. This study focuses on factors within Sustainability Capstone course students’ Sustainability Studies program experience that generated and/or detracted from their motivation continue to learn about and practice sustainability. Given the concept of goal-directed hope articulated by Kerret, Ronen, and Orkibi (2014, p. 84) and the concepts of hope and agency as developed above and in my prior work (Evans, 2012), these motivating factors and detractors are interpreted here as generating or detracting points for hope and agency among my students. Following is my analysis of the thematic content of Sustainability Capstone student responses to my open-ended question survey. My discussion is organized according to the themes that emerged from student responses. Two major organizing themes emerged with regard to both motivators and detractors for hope and agency: 1) conceptual engagement or comprehension of sustainability concepts, challenges, and opportunities and 2) social engagement or learning and action connected to human relationships in classroom, community, and organizational settings and fostered through participation in events. Discussion of my findings is first organized into two categories: motivators and detractors to hope and agency and, secondarily, organized according to conceptual and social engagement aspects of the SUS experience as portrayed by respondents. Analysis of prominent themes within the conceptual and social engagement categories is also further broken down according to relevant subthemes. Quotations drawn directly from student papers appear throughout this analysis in block quotation format. Paragraph breaks within block-quotations denote changes in respondents. The thematic content of student responses reveals an overwhelming focus on motivators as opposed to detractors to hope and agency: 177 distinct thematic comments related to motivators as opposed to 39 comments related to detractors. Eighty-four of the comments related to factors that motivated hope and agency for students focused on conceptual engagement, and 93 focused on social engagement, revealing considerable balance with regard to the importance of each form of engagement. Following is a more detailed analysis of student responses regarding factors in their education that motivated hope and agency. This detailed analysis also gives voice to students through quoting extensively from their survey responses. Conceptual Engagement. Conceptual engagement is goal directed hope and agency based in development of conceptual and ethical frameworks and understanding. This form of student engagement represents both pathway thinking and agency thinking as articulated by Kerret, Ronen, and Orkibi (2014, p. 84). It also embodies hope, and particularly clear-eyed hope – notions developed earlier in this article. Conceptual learning through SUS program as a whole. My education is the major reason to take action towards sustainability. It was a concept that I was unaware of before entering the program, so it is the main motivator. I have past experiences which are motivating me to seek right/purposeful/life supporting actions, but my sustainability education has given me some major shape and direction in this pursuit. Another student mentioned explicitly the transdisciplinarity of the program as a motivator. The conceptual content of specific courses was also mentioned twice as a motivator for hope and agency. Clear-eyed hope as a foundation for agency. The important aspect of the sustainability program for me has been its call to be a participant in society. This active role makes sustainability studies fundamentally different than other programs of study. After learning about some of the world’s problems, I constantly call upon myself to step up to make a change. While there were times that I was very sad and felt hopeless in the face of the global problems, these momentums were grounding and necessary for understanding the importance and seriousness of some of the problems and pushing me to make a difference. Both of the ideas I discussed [the economic system and the energy system] will have a lasting effect on me. This is because I now understand that the lifestyle I grew up with cannot be sustained. And if I continue to live in that means then I am contributing to the issues associated with sustainability. I believe that one day living sustainably will not be an option, we will have less energy to consume and our economic system could drastically change. I believe that actively confronting these issues is the best way to begin to live sustainably. The biggest part of me continuing to stay engaged in school is knowing and understanding why things are the way they are. The other large part of that is recognizing areas where individually we can all get in and make a difference in the world we live in. Primarily, the threats to health and environment from recent gas and oil drilling activity has influenced me to research, hence learn more about sustainability as well as evaluate my lifestyle. Current energy systems and food systems have stood out as the most important and unstable of the systems we rely on. Their importance also makes them the most intriguing, stimulating me to pursue more information about them in order to gain a well-rounded understanding of their strengths and vulnerabilities as well as more resilient options globally and options towards my own actions. The effects from learning sustainable concepts is life changing for me. Knowing the things that I do now, I cannot conceive reverting back to a lifestyle that encourages short-term thinking, avoids looking at systemic effects from actions, and denies future generations similar opportunities that our planet provides. Ecological thinking. Ecological thinking is very closely related to systems thinking in terms of its focus on systemic interconnections and interrelationships. This theme was mentioned explicitly three times in student responses. The realization of the actual costs of our actions has motivated me. Seeing just how one’s individual actions affect others is a powerful motivator for change. I am much more in tune with the products I buy [and] where my food comes from. Learning of the economic tier of sustainability had a significant impact on me. It showed me that sustainability goes beyond environmental concerns. The modern capitalist economic system is fundamentally unsustainable. I now realize that this is one of the major leverage points of sustainability. Learning about enforced dependency not only forced me to critically analyze the systems around me and where I fit in but also gave me an avenue to consider change in that context. The idea of community resiliency and breaking away from globalized systems of enforced dependency. I believe I will see an end to the Wal-Mart culture in my lifetime. Opportunity does not necessarily exist in the corporate world these days, the job market is extremely oversaturated and the amount of debt everyone has accumulated is mind-blowing. To invest in one’s own community is the only way my generation will see dividends. I love that opportunity through the lens of sustainability in our own backyards. Conceptualizing agency for personal, community, and socio-ecological resiliency more broadly also emerged as an important theme, and it included two subthemes: (re)localization and voting with one’s dollars spent. Resiliency as an overarching conceptual theme was mentioned explicitly three times, and the two subthemes of (re)localization and voting with one’s dollars were each mentioned once. Learning about and internalizing philosophical, ethical, and spiritual underpinnings of sustainability. I am really inspired by the more “metaphysical” ideas and discussions as a means of motivating me towards sustainability. These conversations allow me a means of placing myself in the world with purpose, and they are foundational to my understanding of everything else. One of the major motivators for me was to learn about different ways of being. Being able to actually see that there are alternatives to this specific way of life has left me wanting to explore deeper as to why and how we as a culture have gotten to this point. I have found that studying some of the different philosophical foundations of various cultures has interested me. Being able to identify how these foundations manifest into daily/immediate actions is the aspect of sustainability that I have found to have the most value and feel most motivated in looking into these larger structures as I find these to be the greatest leverage points for the sustainability cause. The idea of complete contentedness is very integrated into the SUS program and I think this is something that is stuck in all of our brains and affects us in decision making now. Connection to place has also motivated me. 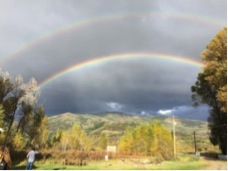 Not this specific place, or CMC, or even the community of Steamboat, but drawing the larger connection of being a being on this planet. The idea of holism and interconnectivity of all things has truly worked to shape how I view the world and how I should fit in with it. I chose to relate much of the course work to areas of my life, giving me connection and a base to build off of. These ideas are sometimes like morals. So once adopted into my life, they became easier to have lasting impact. Another big motivator has been the exploration of injustice. The exposure of injustices worldwide against beings of all nature has worked to motivate me tremendously. In trying to find real value in future work, not just financial value for myself, working to make the world a more just place is what I am seriously considering doing. Realizing just how unjust the situation is for so many has really motivated and inspired me and is shaping the direction in which I wish to take my life. They are ideas that are crucial to long lasting and healthy communities where all citizens have equal opportunities at succeeding. Conceptual engagement was clearly seen as vital to many students’ sustainability-oriented hope and agency. We now turn to an analysis of the second broad theme emerging from SUS students’ survey responses: social engagement. Social Engagement. Emphasis on social engagement slightly surpassed conceptual engagement in student survey responses (mentioned 93 times as opposed to 84 times for conceptual engagement). This finding points to the importance, not only of having a well-conceived conceptual framework for sustainability education, but also to the importance of fostering mentoring relationships, civic and campus engagement opportunities, student-driven research, and other forms of experiential learning that encourage students to make powerful connections to others within the context of sustainability learning and action. Social engagement promotes social trust, pathway thinking, and agency thinking – all key aspects of goal-directed hope as defined by Kerret, Ronen, and Orkibi (2014, p. 84). I came to school with a motivation to make a difference, but my education has expanded my motivation in many ways. The real world examples are the reasons why I do anything, because at the end of the day, my motivation centers around people. Therefore, the more my education relates to real people, the more I am motivated to learn and take action. Two students also commented on sustainability gaining traction in society as a motivating factor for hope and agency. Importance of immediate human connections and relationships. The main motivation to continue learning and pursuing sustainability and sustainable action initiatives, for me, has been the ability to talk and to work together on ideas, actions, etc., with others. I’ve found so much hope and inspiration through my fellow classmates and teachers. Curriculum wise, I have enjoyed the guest speakers and most of the required reading materials – I use each often in my conversations both inside the program and those with outside organizations/individuals. Educating and motivating others also emerged as an important theme (mentioned six times). This finding was somewhat surprising given that the SUS program has not focused as explicitly as it could on building students’ capacities as educators. Engaging in community organizing and community sustainability work was also seen as a strong motivational aspect of respondents’ SUS program experience (mentioned 8 times). One student mentioned the importance of “bringing stakeholders together for a tangible learning experience.” Another highlighted the motivating value of required community involvement while yet another focused on the importance of learning community organizing skills (“how to coordinate and inspire volunteers, how to create a network of support for launching programs”). the most lasting activity might be the [CMC] Sustainability Conference, because it will always remind me no matter where I go, that there are people all over the world, let alone this state or country, that believe in sustainability and are working towards it. Many students were clearly strongly motivated through diverse opportunities and avenues for making direct connections and forming relationships with others. Given the diversity of avenues and approaches to these ends identified by students, it would be difficult at this time to identify particular pedagogical or programmatic best practices to fostering these relationships. Perhaps the lesson here is that many diverse opportunities and strategies for social engagement are necessary and effective for generating hope and agency among diverse students. Experiential learning also emerged as a very important subtheme of hope and agency within social engagement (mentioned 24 times). Experiential learning promotes pathway thinking, agency thinking, and social trust as defined by Kerret, Ronen, and Orkibi (2014, p. 84). Real world application that is experiential and participatory is the best way that I learn. With sustainability, momentum is really important to me. I am motivated by the momentum of excitement and success, so doing projects, even small ones, and seeing their results is important. I feel like getting into the field has played a large role. I loved the Garden to Table event and I feel like that really allows for us as students to get involved in a positive way. The biggest thing that motivated me to take action towards sustainability was the hands on experience I had in [the garden-to-table event in] the culture and place based equity class. Having a personal connection with my local food economy got me very interested in wanting to be more involved. Extracurricular involvement in activities, projects, and clubs was also mentioned four times as a significant aspect of experiential learning. Experiential education as a vehicle for holistic understanding of sustainability issues was emphasized three times, and one student emphasized that experiential learning allowed her/him to make a strong personal connection to issues studied. CMC also has a strong Outdoor Education two-year degree program that serves as a significant feeder of students into the Sustainability Studies program. Involvement in Outdoor Education experiential courses was mentioned three times as a significant contributor to students’ hope and agency. My capstone project experience significantly contributed to my motivation to continue learning about and taking action toward sustainability. It was a process of exceptional growth for me and my experiences have inspired me to want to pursue higher education opportunities. Self-efficacy in terms of confident, empowered engagement emerged as the third most emphasized theme (mentioned 18 times) within social engagement. This theme embodies pathway thinking and agency thinking as defined by Kerret, Ronen, and Orkibi (2014, p. 84). Student comments indicated that the program fostered their sense of self-respect, leading to efficacy and empowerment. One student discussed how learning about overcoming barriers to action had generated her/his sense of hope with regard to pursuing sustainability action. Another student recognized many career/action opportunities open to her/him, and another mentioned that s/he had relevant skills and fortunate timing to enter the sustainability field on the ground floor. Another student discussed how s/he felt motivated and prepared to enter graduate studies (quoted above). The cumulative power of taking small steps in sustainability- oriented personal change was also highlighted in one student comment as a recognized source of self-efficacy. Overarching pride and satisfaction about knowledge and abilities gained through the SUS program was highlighted by students three times. Pedagogical aspects of social engagement. Pedagogical aspects of the program related to generating and maintaining hope and agency through activities and assignments relevant to or requiring social engagement were also seen as important to students (mentioned nine times). Solutions-oriented, real-world examples offered in classes were highlighted six times as important to generating hope and agency among students. These examples can promote pathway thinking among students. Process orientation of social engagement for sustainability. The innovative and creative capacity of studying sustainability, combined with the strong potential to begin to heal the wounds of our world and create a more just and beautiful path for our future is the most field I have ever experienced. Every one of us is capable of understanding sustainability in some version or scale, and as students of this field we have the tools to articulate these ideas and help spread them, whether planting tiny seeds of thought where we can or making bold moves. This field inspires thoughtful, meaningful action. The idea of investing in future generations, to look systemically at problems I encounter and to compassionately communicate my ideas to my neighbors will stick with me for life. Other comments emphasized agency in the form of communicating to influence and persuade others to move toward sustainable living. These comments focused on “understanding spheres of influence” as well as communication as a “leverage point” for “shifting human psychological perception to want to create change in the social/political/economic sector(s)” leading to “resilience in food systems, energy and water.” One comment focused on using the power of media (“photographs, film, fine art, digital, etc.,”) as a “leverage point for creating awareness and influencing change. Aspects of social engagement that motivated hope and agency among students were highly diverse. This finding seems appropriate and accurate given the incredibly diverse field of sustainability, and it points to the need for sustainability education to embrace the breadth of opportunities for social engagement open to programs, classes, communities, and individuals. This finding also points to a significant challenge to those of us engaged in sustainability studies programs: the need to organize and coordinate significant and diverse opportunities for our students to engage socially within the sustainability realm. Limited resources and limited time to support such endeavors can translate into foregone opportunities to generate and maintain hope and agency among our students. The most effective sustainability studies programs are likely to be those that effectively support both the conceptual and social engagement of their students. Overall, student survey responses demonstrated an overwhelming focus on motivators as opposed to detractors to hope and agency: 177 distinct thematic comments related to motivators as opposed to 39 comments related to detractors. Three students explicitly noted that they had experienced no detractors to hope and agency in the SUS program. Still, student comments related to detractors to hope and agency are important and useful to designing effective sustainability teaching and learning processes, and some of these comments are quite powerful. Students offered 23 comments on conceptual-engagement-oriented detractors to hope and agency and 16 comments on social-engagement-focused detractors. It was not a specific idea or activity that impacted my motivation, but there was a point when I became run down because I felt I had spent too long focusing on the myriad of issues in the world related to sustainability. Constantly focusing on the problems is not a healthy state to exist in. It took a while for me to be able to balance the problems with positive aspects. There is hope in the sustainability realm, and I think it would be beneficial to the students to have positive points highlighted throughout the program. One of the things that unmotivated me is the fact that it can be very depressing to learn about how unsustainable our world is, especially our American culture. Sometimes thinking about our environmental, economic and social problems caused me significant anxiety and stress. Water issues are the most stressful. Doom and Gloom. It wasn’t until the last semester that we were allowed to take our research in which ever direction you would like. It would be cool to see a program designed to let students take their ideas and sprout them early on and to continually watch them grow. Ultimately leading to presentations by each student at the SUS conference describing in detail, what they did, who it will effect, how they got there, etc., instead of only using a semesters worth of time when students are only thinking about being done. Many comments related to emotionally challenging aspects of sustainability studies that detracted from students’ hope and agency noted that the demotivating emotional responses they experienced were temporary and/or occasional, not pervasive, and/or that negative emotions were eventually balanced by content that generated hope and agency. Students also often noted the importance of learning emotionally challenging concepts and information as a necessary precursor to generating clear-eyed hope and motivation for agency. At times it’s extremely depressing to be part of the program. For a while I wanted to drop off the face of the earth only to not be part of the American system, but you shortly realize that isn’t the way to initiate change. At times the enormity of the idea of sustainability can be daunting, overwhelming, scary, intimidating, etc. At times I had to ‘switch topics’ so to speak to avoid getting depressed over the situation. My overall experience in … sustainability studies has been nothing but positive. The curriculum is at times depressing, due to the subject matter but CMC has allowed me to harness this experience in the midst of my very busy life. I think that the biggest [demotivator] is all the negativity that comes with sustainability. Such as climate change and trying to reverse the effects of our societies damage to the world. Hearing about places that are past the point of no return. Hearing that the ice caps are melting and how we are destroying ecosystems. It really gets to you after a while and makes you question if you are dong the right thing. As well as if your input or efforts matter in the long term. On the other hand though I feel like the positives make everything worth it. The positive impacts are such a sense of pride and accomplishment that I can look past all the negative news. As students here we know the importance of sustainability. Seeing that sustainability is gaining traction and is more then a fad in mainstream America is so encouraging. Occasionally I would wish I had not learned many of the lessons that are part of sustainability studies, that my color choices made rivers in China run blue that year, or social inequities that I contribute to every day, but I also see how much potential, possibility and action is out here in the real world, and how every person can in fact make differences, personal, community, and beyond, and being aware is a good place to be. Of course the doom and gloom topics such as environmental destruction, peak oil, and the capitalist system taking advantage of people all over the world are all things that bring me down. However they are extremely important topics to learn about because they are the realities of our world and if we ignore them then people and the planet will suffer greatly. I would say that each idea and activity I found valuable throughout the Sustainability Studies program…. When you initially begin the program, it is easy to feel hopeless because there are so many things that we need to work on both on an individual level and as a society, world, etc. That can be intimidating to say the least. But equally there are positive people, ideas, and activities that revitalize your spirit along the way. What I’m saying is that, while educating yourself in what sustainability is can be daunting, and in some ways you’ll never look at your life in the same way again, what you gain from the program is so much greater than remaining ignorant. In the conceptual engagement realm, two comments on detractors to hope and agency focused on epistemological, subject, and process differences between science-focused courses taught in the SUS program and other courses sustainability studies. One student expressed interest in learning more applied science with a focus on sustainable design, biomimicry, and ethnobotany. Another student focused intently on the epistemological differences between sustainability studies as a normative field and science’s traditional focus on objective detachment as a process for generating new knowledge. This student suggested more focus on social research than on science as a lens for sustainability-oriented inquiry. Continually repeating the same ideas that are brought up over and over gets old. Eventually whether we do it consciously or not, my mind begins to stop listening because you know exactly what’s going to be said. After a few years of hearing the same sermons regarding climate change, peak oil, systems thinking, biomimicry, economic hegemony, etc., I find myself turning my ears off and attention elsewhere. It is not that I feel I know everything that is being taught – it is more that I find that nothing new is being taught. I notice that if there are new and unfamiliar concepts that are mentioned or covered, my attention is recaptured, however this seems rare. I also find myself seeking more information on sustainable topics that aren’t covered as much, i.e. social inequity and sustainable markets and economic models. The repetitiveness and crossover of different classes and their themes is important and helps to further distill them. I have also felt repetitiveness to be distracting because then I do not listen or read as carefully because I skim, and I no longer search for new connections…. However, I think that if the same themes are applied in a different way more specifically to different classes and in different fields of study, the crossover becomes very beneficial. Classes would argue completely opposite points and seemed to counter balance what the others had taught. To me there seemed to be lack of common goal and practical application of sustainability studies and for this reason seemed to detract from a lasting experience. These detractors turned into motivators for me and really taught me how to talk about complex problems in laymen’s terms and really begin to spread understanding of the areas that I was working on. One comment related to conceptual engagement the detracted from hope and agency focused on the role and pace of the Capstone course in the program. This comment suggested that the Capstone course should be spread over two terms so that students would have more time to design and carry out an independent research project, particularly if that project required Institutional Review Board approval. The commenter suggested that the extended time period could motivate rather than discourage student engagement in Capstone research work. Early in my sustainability studies I did experience a couple of times where the material I was presented with seemed to really focus on the separation and almost disassociation of the environmental movement with the sustainability movement. Because I have so much love and appreciation for the natural world, and really identify with the natural environment as part of myself, and I was put-off by this. I do understand how the movements are separate but this only makes sense to present when one is also presented with the idea that the natural world is not the sole tenet of sustainability, but also that sustainability is not possible without authentic acknowledgement of the significance of the natural world. That only small initial detractor I mentioned was not long-lasting I would say, because I understand how that was part of the sustainability story, and the impetus behind that desired separation of movements was due to ways the environmental movement had failed to be effective and created barriers in the past. It was important to learn from those lessons so that sustainability does not follow in the same path so as to end up with the same criticisms – it is an evolution in effective social theory. These comments point to the need for educators to take care when distinguishing environmentalism from sustainability so as to avoid demotivating those who have a strong commitment to environmentalism as a social movement. They also point to the possibility that students who harbor these commitments might find it challenging, though important, to study environmentalism as a social movement that has not adequately addressed important aspects of social equity and economic well-being. We now turn our attention to student survey responses regarding detractors to hope and agency in the social engagement realm. The lack of community involvement in my classes made me get bored quickly. A lot of classes said things like “we should” or “why don’t we” statements where we could have been saying “we are going to do” or “we will be doing.” Minus the exception with the Yampatika [gardent-to-table] event, there was hardly any community involvement in my classes. I think there are many opportunities in the community to put these ideas into action rather then on paper in theory. These comments evidence a desire for more experiential education, reinforcing that community and project engagement can represent a motivating force for hope and agency. The lack of bringing in local stories from the Energy and Ag sectors was also disappointing. For instance, it would have been useful to hear from some coal mine representatives in person. Also wished for some more local focus – much time was spent examining issues in the developing world and indigenous cultures there but virtually none of our own local cultural history. There were one or two classes (instructors, specifically) that were less than helpful. Instructors can really make or break a class not just with assignments but also with in-class discussion topics and steering conversation. Sometimes a topic can be taken in a very negative way (which is easy when you’re dealing with such heavy subject material like food justice or environmental degradation), but can be pushed in a more positive direction with the help of instructors; those that dwell in this negative space really corrupt sustainability education. Another student commented on discouragement of free speech in some classes, and one student expressed deep frustration with a professor critiquing an idea s/he offered about agency in the business world. These comments point to the need to proceed gently in critiquing students who may be in the early stages of finding their voice and forming their ideas for agency. One student also commented on what s/he saw as uneven course quality, particularly in the early stages of launching the SUS program. I felt that this degree had a lot of writing which is a very important skill, but I thought that as a student I could have been prompted in a more engaging way – where I had the option to do a non-traditional writing piece, which is why Writing in Sustainability was good, but for future I think to push the envelope even further and get students away from writing memoirs or reflections. I feel as a student of the traditional education system all my life, it is habit to revert to the easiest type of writing, and [I] really respond well to teachers opening the door to other possibilities to explore. Some pushback from the negativity associated in the public forum with the term “sustainability” which in some quarters is pejorative. One minor thing was the ability to educate without preaching, the professors do a great job at this, but taking it to the field, I found was rather challenging. These comments, together with the comment on writing assignments in the program point to a need to increase program-wide attention on developing students’ public communication strategies and skills, both oral and written. CMC SUS program faculty are already initiating program-wide work in this area, and these comments will provide further insights useful in designing those efforts. Educators in other settings mays use these comments to consider how teaching and learning through communication can best be applied in their own work. We now turn our attention to student comments on the duration of the effects of their educational experiences that motivated and detracted from their senses of hope and agency. Yes they are lasting, it is my last week of college and my only feeling is excitement, not to be done with school, but the opportunity to move forward and keep learning. Yes, my worldview has changed profoundly. Once I found out about the more complex relationships associated with my day to day life, like buy food at the grocery store and its broader global implications, I was unable to shake this knowledge. It is definitely a lasting effect. I think about our dependence on oil everyday. I also think about our dependence on petroleum products, like plastic, everyday. It is everywhere. You can’t get away from it. Most of the … mentioned motivators have stuck and will stick with me. They are larger concepts and philosophies instead of individual actions for specific problems, which I feel is a better approach to teaching/promoting sustainability, as these philosophies can be applied to all situations. Everything in this program has had a lasting effect. The positives and the negatives. I think that sustainability is a learning process. We need to avoid what does not work and know why it failed. On the flip side we need to continue to utilize and improve what does work. I have gained so much more from this degree then I ever could have imagined. In two years I have found a new passion. Something that I truly believe in that will make a difference in the world and I am proud to be a part of that. The effect of Sustainability Studies and all that comes along with that will forever be a lens that I view the world, and myself, with. Once you open up your awareness to the things around you, I’m not sure if there’s ever a way to reverse that and just sweeping it under the rug is no longer an option. Each decision I make is weighted with the education I received through this program. More than just terms and systems were learned while making my way through this program. Life-long friendships were made and life lessons were abundant. Absolutely, these were lasting effects. The systemic nature and scope of the ideas presented in this program are powerful, inter-disciplinary, and impossible to ignore. These are not passing stories but they are ideas that permanently permeate your perspective on the world. These ideas teach us to connect the dots between the forces behind the major issues facing our world and this is the kind of thinking that once learned, seems unlikely to be undone. These comments suggest that the conceptual and social engagement aspects of the SUS program have had a profound effect on the worldviews and life directions and choices of many graduates. The run down feeling was luckily not a lasting one. After seeing all of the positive action being taken towards sustainability I regained motivation to continue focusing on sustainability initiatives. By discovering ways to overcome the challenges of implementing sustainable behavior I regained a sense of hope in pursuing sustainability. By no means did I lose motivation over these topics because I have conviction to change the very systems that are plaguing the health of the world. Because none of these things detracted from my learning experience I feel as if my activity towards sustainability will not be hindered. Evidence examined for this study suggests that emotionally challenging material and specific aspects of pedagogy and professor interactions with students can detract from students’ senses of hope and agency. This effect is likely temporary, however, within the long-term, broad context of an educational program designed to foster conceptual and social engagement that promotes students’ pathway thinking, agency thinking, and social trust. Sometimes what may seem like small action projects can have a big effect on students’ hope and agency. For example, what I thought was a very small project (a garden-to-table dinner benefitting a local nonprofit) had a huge effect on helping a couple of students understand and feel passion toward the prospect of a localized economy. The event also had the lasting effect of helping them make personal connections with the local food economy and spurred their desire to become involved with that effort. Though most students offered an overall positive appraisal of their SUS program experience, a good number suggested increasing the solutions-oriented and active engagement content and pedagogy of the program. These comments corroborate the CMC SUS faculty’s desire to continue to enhance these pedagogies, and they suggest that similar programs might do well to do the same. Experience conducting original research can be very powerful indeed for some students who may become motivated to pursue graduate education. Students saw their degree work as highly relevant to multiple facets of life: both personal and professional, introspective and outwardly driven. Many expressed an orientation toward meaningful personal and social transformation. The sense of commitment to sustainability voiced by students was striking as was the evolution of students’ worldviews through their studies. These educational outcomes are vital to a field that aims to transform society. Hope is rooted in men’s incompletion, from which they move out in constant search – a search which can be carried out only in communion with others. Hopelessness is a form of silence, of denying the world and fleeing from it. The dehumanization resulting from an unjust order is not a cause for despair but for hope, leading to the incessant pursuit of the humanity denied by injustice. Hope and agency are essential for any social movement, and sustainability is no exception. Sustainability education represents an important avenue for generating and maintaining hope and agency among students, in Cajete’s words, for “finding heart” (2000, p. 288). In our sound bite world, “information” is decontextualized, making it difficult to comprehend and limiting its usefulness as basis for the systemic understanding we need connect the dots regarding complex and pressing socio-ecological problems of sustainability. Sustainability education can call upon students to slow down, observe carefully, and think critically, deeply, and holistically. It can also engage them in action that is interconnected with conceptual learning. Through engaging students conceptually and socially, education can foster sustainability-oriented hope and agency. Students and graduates who carry a heightened sense of hope and agency into the wider world are prepared to contribute effectively to sustainability as a social movement. The findings of this research support the vision of sustainability education as a vehicle for generating clear-eyed hope among students and graduates, hope that leads to envisioned and pursued avenues for action. If students do not learn through in-depth conceptual engagement about the systemic underpinnings of the sustainability crisis and the entrenched power structures that support the status quo, they may interpret deeply resisted or thwarted efforts to resolve the sustainability crisis as personal rather than systemic failures, an interpretation that is likely to lead to burnout with regard to sustainability activism. Therefore, it is extremely important for students to conceptually engage with sustainability challenges as well as to socially engage in hope and agency inspiring actions. Students who participated in this research expressed that both conceptual and social engagement were essential to stimulating and supporting their senses of hope and agency for sustainability. The diversity expressed in student comments regarding specifics what they viewed as important to their hope and agency related motivation was extensive given the small number of research participants, but the importance of both conceptual and social engagement was emphasized throughout the data analyzed. Student survey respondents also overwhelmingly focused on motivators for hope and agency as opposed to focusing on detractors. This result may, in part, be attributed to the fact that questions on motivators appeared first within the survey questionnaire, but I do not think the wide disparity in emphasis can be explained solely by survey design. On the whole, students completing the SUS program expressed pathway and agency thinking as well as self-efficacy as agents of social change. They also expressed some degree of social trust related to other actors in society moving toward sustainability. My findings here corroborate, from a different methodological approach, the 2012 study by Maria Ojala that identified constructive hope as a significant contributor to agency. It seems likely that agency as experienced through social engagement aspects of sustainability studies, also contributes to hope so that hope and agency are mutually reinforcing within the sustainability education context. My findings also offer empirical support to the theories of Kerret, Ronen, and Orkibi (2014) regarding goal-directed hope as a motivator for agency and a key component of subjective wellbeing, though the educational setting and age group studied here differs from those addressed by these authors. Given that students see roles for themselves as educators, sustainability studies programs would do well to highlight this skill, among other forms of conceptual and social engagement. Care must be taken not to overwhelm students with emotionally challenging material. However, developing a clear-eyed understanding of sustainability issues through deep conceptual engagement is a key factor in motivating continued sustainability learning and action. Continued Research. I plan to continue this research for a number of years, perhaps indefinitely, in order to develop a rich set of data that approaches the “data saturation” described by McIntosh (2011, chap. 12) demonstrated by sharply diminishing returns with regard to the emergence of new themes in data gathered. I also plan to use this research continually as a source of program improvement for Sustainability Studies at Colorado Mountain College. You’re invited… To take my research methodology and methods, please, and apply them in your own educational settings! I encourage you to conduct similar studies focused on generating and maintaining hope and agency in sustainability education, and I am happy to talk with you about doing so. The robustness of grounded theory derives from its broad application and the resulting development of data-driven theory. I hope this article will help to stimulate similar, rigorous studies that can lead to the development of robust theories regarding best practices for generating and maintaining hope and agency through sustainability education. I encourage all interested parties to contact me to become part of the Hope and Agency Research Collaborative as a professional network of sustainability educators interested in questions of hope and agency in sustainability education. It is my hope that this collective work will ultimately lead to increased effectiveness of sustainability education as a transdisciplinary field within the sustainability movement. If you would like to replicate this study at your institution or otherwise collaborate, please contact me: tevans@coloradomtn.edu; 970-870-4517. Concluding Vision and Voice of Hope. I would like to conclude with a few quotations from my students that speak powerfully to the potential of sustainability education to help students to “find heart” (Cajete, 2000, p. 288). What is special about a degree in Sustainability [is that] there is no end to studying it. It is always changing and adapting to the situation, and can be implemented in every single aspect of life. I am a completely different person than I was when I started this program. The way I think and interact within the systems that we live in is night and day different. I believe in a simpler more self sustainable lifestyle and am making steps towards that goal. My education around sustainability has created opportunities for me to adjust my life and create a healthy perpetual learning environment for myself and future generations. These are life-giving and life-changing ideas. Evans, T. L. (2012). Occupy education: Living and learning sustainability. New York: Peter Lang. Freire, P. (1970/2000). Pedagogy of the oppressed. (30th Anniversary Ed.). New York: Continuum International Publishing Group. Gramsci, A. (1971/1999). Selections from the prison notebooks. New York: International Publishers. Havel, V. (1990). Disturbing the peace: A conversation with Karel Hvížďala. (P. Wilson, Trans.). New York: Knopf. McIntosh, A. (2011). Teaching radical human ecology in the academy. In Williams, L., Roberts, R., & McIntosh, A. (Eds.) Radical human ecology : Intercultural and indigenous approaches. Farnham, Surrey, England: Ashgate: chap. 12. Orr, D. (2009). Down to the wire: Confronting climate collapse. New York, NY: Oxford University Press. Pittman, J. (2007, August). Whole systems design and living sustainability. Presentation given at the orientation to the Prescott College Ph.D. Program in Sustainability Education, Prescott, AZ. Snyder, C.R. (2000). Genesis: The birth and growth of hope. In Snyder, C. R., (Ed. ), Handbook of hope, ed. C.R. (pp. 25–38). San Diego, CA: Academic Press. This assignment calls for you to reflect upon your experience in this course with particular emphasis on how the course applies to your life as an individual and to our collective lives as local/global citizens. Part I: Please use the following questions as vehicles for reflection, but do not feel your discussion has to be limited to answering only these. How has or hasn’t the course influenced you regarding your current and future actions? Has your worldview changed in any way? Why or why not? What are the most important pieces of information related to energy technology, policy, and economics that you would like others to know? Why are these so important? What kinds of actions would you recommend as most important for individuals, communities, nations, and/or other entities to take regarding the future of energy supplies, energy use, economics, and/or government policy? Why are these actions important? Part II: Consider the action project in which you engaged. Consider how this project related or did not relate to class readings and discussions. You do not have to be in love with this project! Please offer your thoughts on how you integrated or were not able/inspired to integrate this work with what you were learning in other parts of the course. How and why did or didn’t this project enhance your learning in this course? How will you use this experience in the future? If you are certain you won’t use it, why not? Did the project influence your state of mind with regard to energy transition? Why or why not? If it did influence your state of mind, in what way did it do so? Be sure to say specifically what you did for your action project. Compose your reflection as a paper written in paragraphs. Please word process this assignment and hand it in in printed form. You may choose to incorporate quotations from course texts to strengthen your discussion, but these are not required. There is no specified page length recommendation for this assignment. However, as this class is at the upper division level, you will be expected to demonstrate depth of thought appropriate to a closing reflection on an upper division college course. My hope and agency focused work has also been shaped by many other theorists and practitioners as well as by my personal experience teaching and mentoring students. My journey as an educator through 2011 is articulated in some depth in my book Occupy Education: Living and Learning Sustainability (2012). This study represents a continuation of that journey. For further explanation of transdisciplinarity as applied to higher education, see also Evans, 2010. My research and this article were, in large measure, sparked by my leadership work in the hope and agency research collaborative. The collaborative and its members were also instrumental in initiating this themed issue of the Journal of Sustainability Education focusing on hope and agency in sustainability education. Members of the collaborative have participated in conversations about our hope-and agency-related efforts as educators, have encouraged one another, and have offered each other research advice. We have also given two presentations about out work at the annual conference of the Association for the Advancement of Sustainability in Higher Education. Members of the collaborative have included Jordana DeZeeuw Spencer, Richard Kahn, Marna Hauk, Rachel Forbes, Lee Ball, Denise Mitten, and myself. See the introductory article to this issue of the JSE for further information on the Hope and Agency Research Collaborative. For further information regarding similarities and distinctions among multi-, inter-, and transdisciplinary programs, see Evans, 2010. I place “re” in parentheses here in recognition that place-based cultures remain alive in diverse places globally. For members of these cultures, the “re” in such words as reinhabitation and relocalization may not apply, and there may be no need to re-create sustainable cultures. The parenthetical “re” also recognizes that, for some peoples and places, examples have never existed or no longer exist to draw upon for place-based living, meaning that localized systems of sustainable living must be created from scratch.